The past year has been another very successful one for this small, all-volunteer organization. 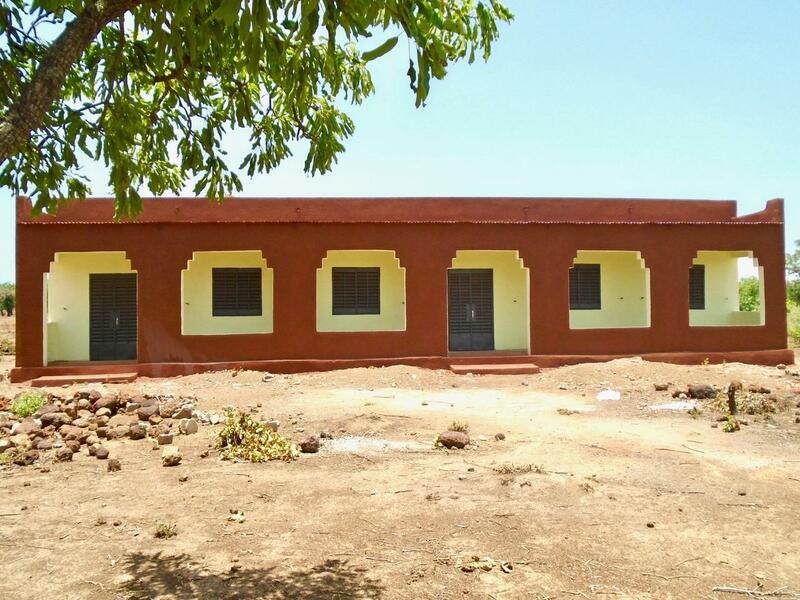 A year ago, we started construction on our 18th and 19th schools, in Kodialanida and Nolabougou, which were completed in late winter; our 20th, in N’Dalle, was completed later in the spring. 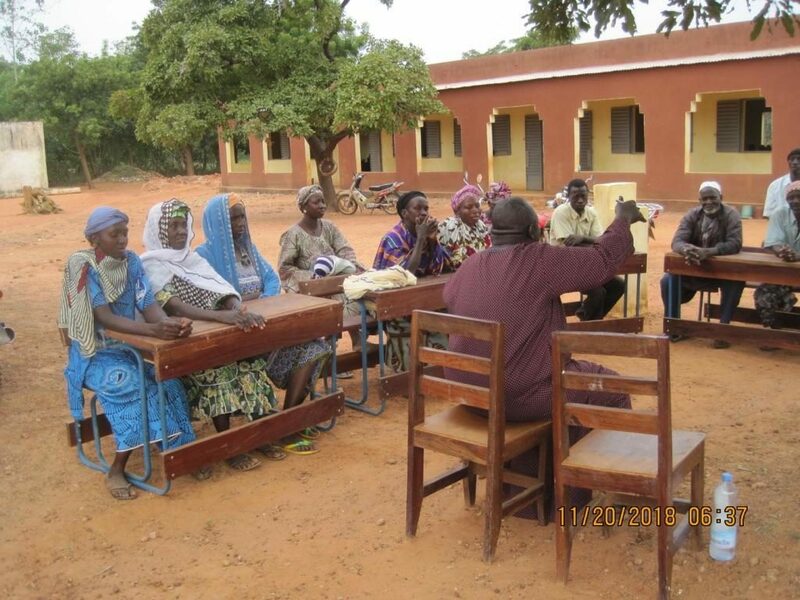 On my recent visit to Mali, we visited all three schools, and found all were doing well. 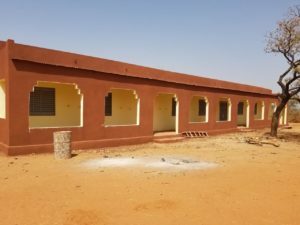 N’Dalle now has enough classrooms for grades one through nine, but Kodialanida and Nolabougou would like to have enough cement-block classrooms for grades 1 – 6. In the community of Danzana, construction of a three-room middle school was well under way. Construction is expected to be completed by late February or early March; the walls are up already; the roof will go on next week. 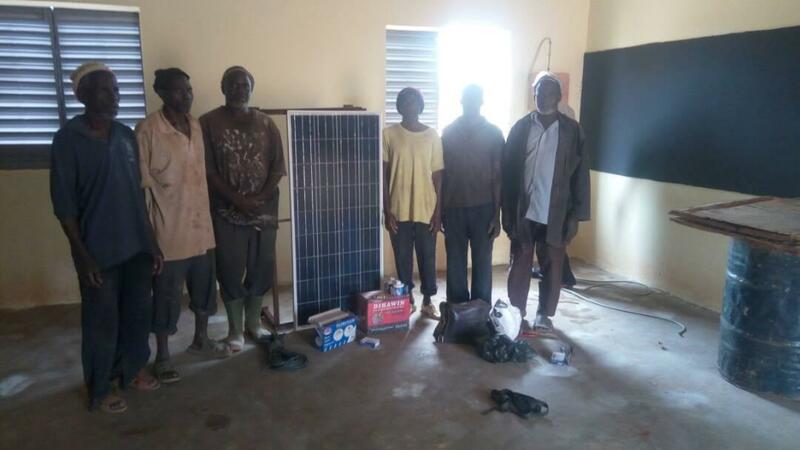 The family that funded three classrooms last year in Kodialanida has also fully funded the school in Danzana, including solar panels to provide lighting for evening studies, adult literacy classes, homework, and community meetings. 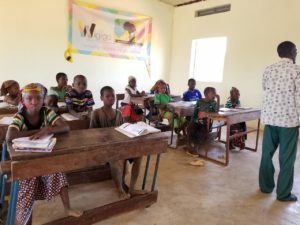 They also donated $1,000 for classroom supplies: maps and globes for each classroom, dictionaries, both English and French, science charts and posters, teachers’ manuals for all subjects, and much more. 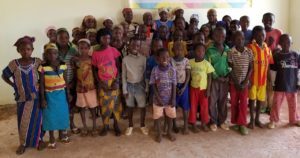 Dear Build a School in Africa supporters – I’m happy to share with you a few photos from Director Judy Lorimer’s visit to Mali in November 2017. 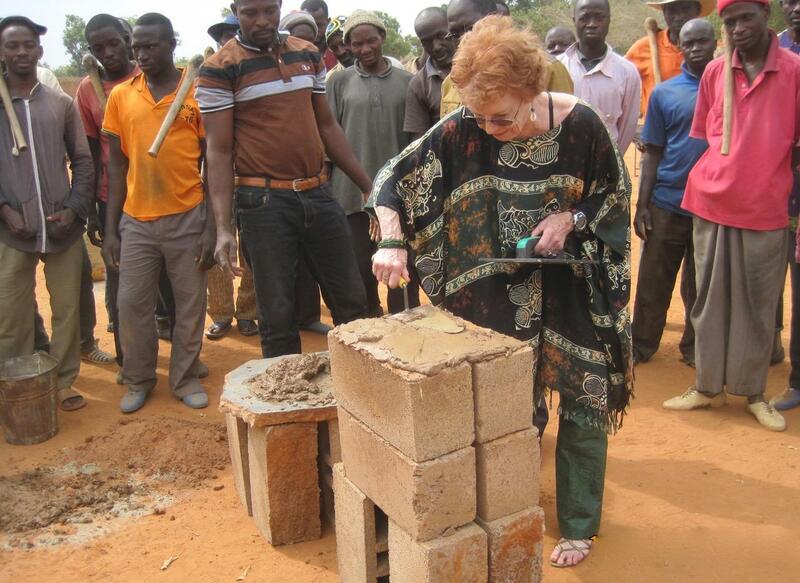 Judy helped start construction of two new schools in the villages of Kodialanida and Nolabougou, visited several schools we had built since 2011, and visited two communities that have requested funding for new schools. 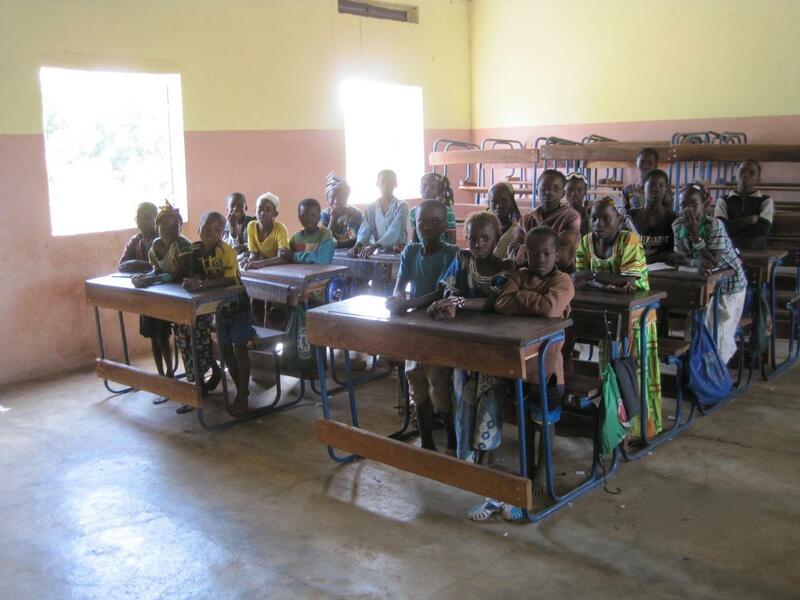 The two schools begun in November are now completed and in operation. 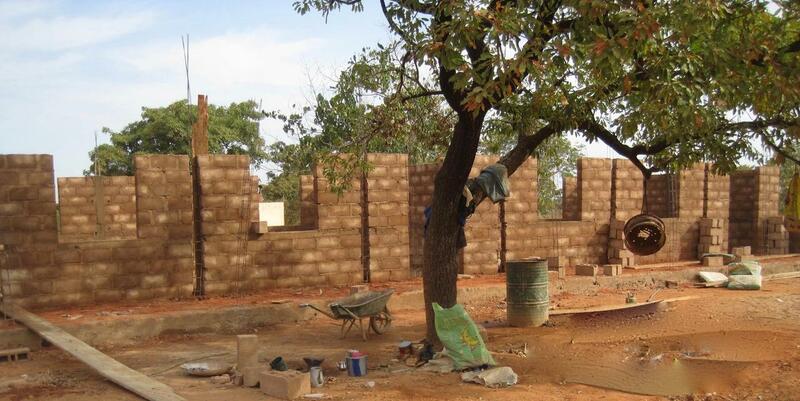 Since then, we have also begun construction of a new school in the village of N’Dalen. New school building in Kodialanida, begun in November 2017. 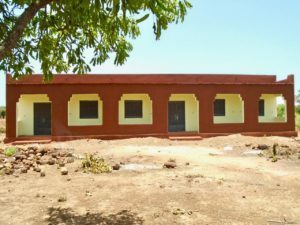 There are three new classrooms in Kodialanida. The family that funded the entire school also donated funds for solar panels for one classroom, so children and teachers could do homework or work on curriculum plans in the evenings. Class in session at the new school in Nolabougou. Students in Nolabougou. One of the few photos where the kids smiled for Judy. 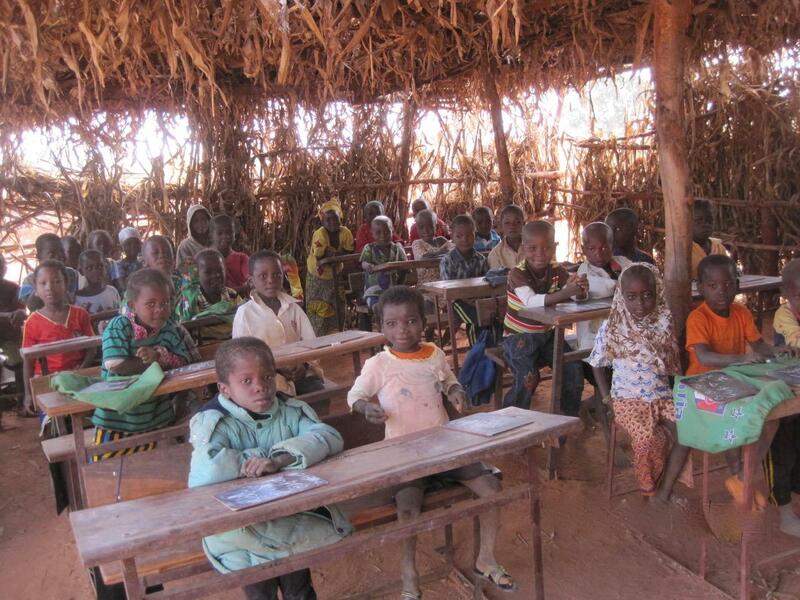 Education is serious stuff in Mali! This was an exceptional year for this tiny non-profit organization. 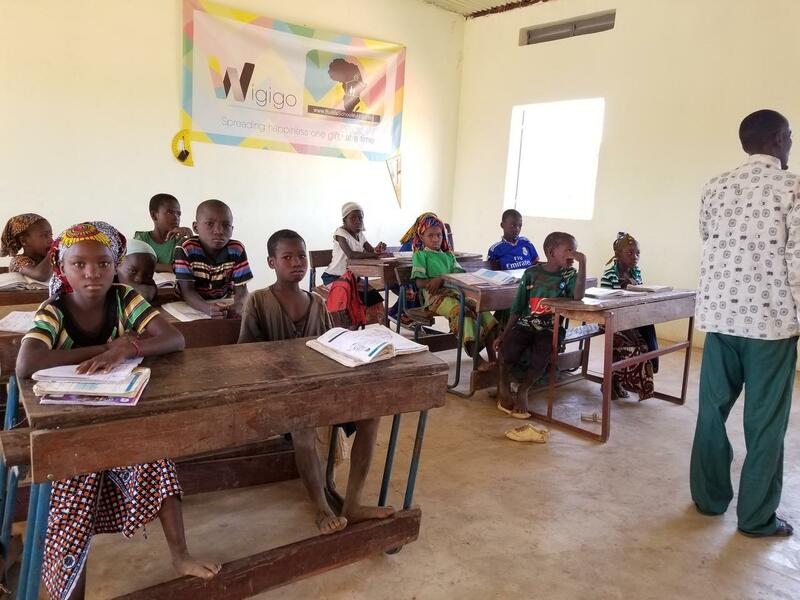 Our 17th school was completed in Doumanaba last spring, providing new classrooms to replace classes that had been housed in an old storeroom, and two more schools are presently under construction. 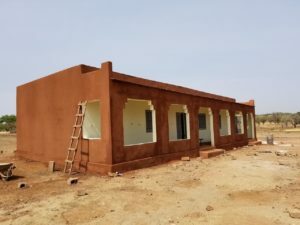 Our 18th project was to build a new school in the community of Kodialanida; the roof of one of their classrooms had collapsed earlier in the year, injuring several children. We were exceptionally fortunate to be contacted by a generous family in the American west; they not only donated funds for THREE classrooms, but also added solar panels for one classrooms, giving children and teachers the ability to do homework or plan lessons after dark, and provide evening literacy classes or hold meetings. 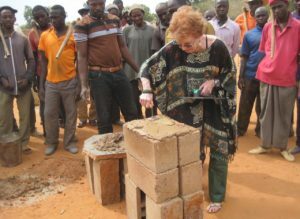 In November, BSA Director Judy Lorimer traveled to Mali (at her own expense) to participate in the groundbreaking ceremonies for Kodialanida and also Nolabougou, where we planned to build two new classrooms. In 16 days, the walls of Kodialanida’s new school were up to the tops of the windows. 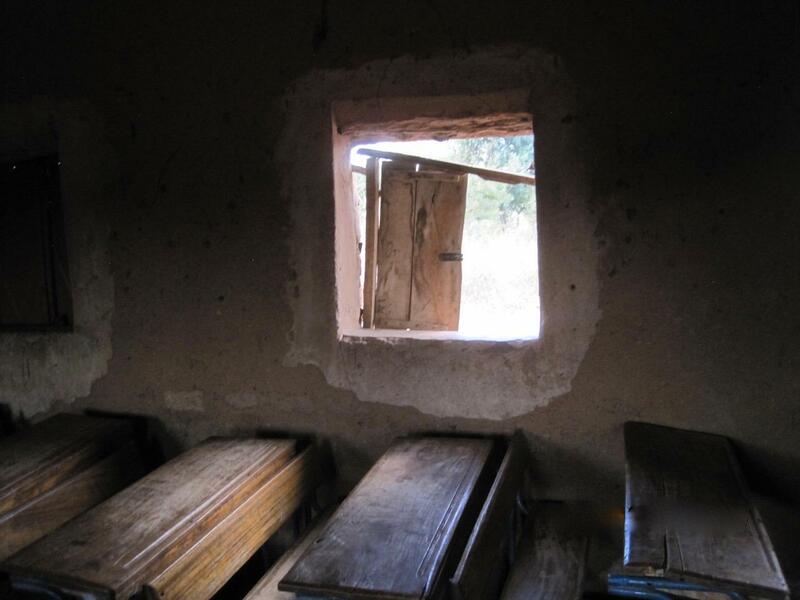 In Nolabougou, they had three cement block classrooms that had been built 20 years ago and were showing their age – crumbling cement around rusted or missing doors and windows, cracked walls, and broken concrete floors. Since Save the Children had recently built new latrines and the office/storage building that BSA usually builds, we will be able to use those funds to repair and paint the old classrooms as well as replacing temporary or mud- brick classrooms with brand new ones, thanks in large part to a substantial donation from Wigigo. We visited four schools that we have built since 2011: Sossoro, Kounfouna, Tiogola and Doumanaba. 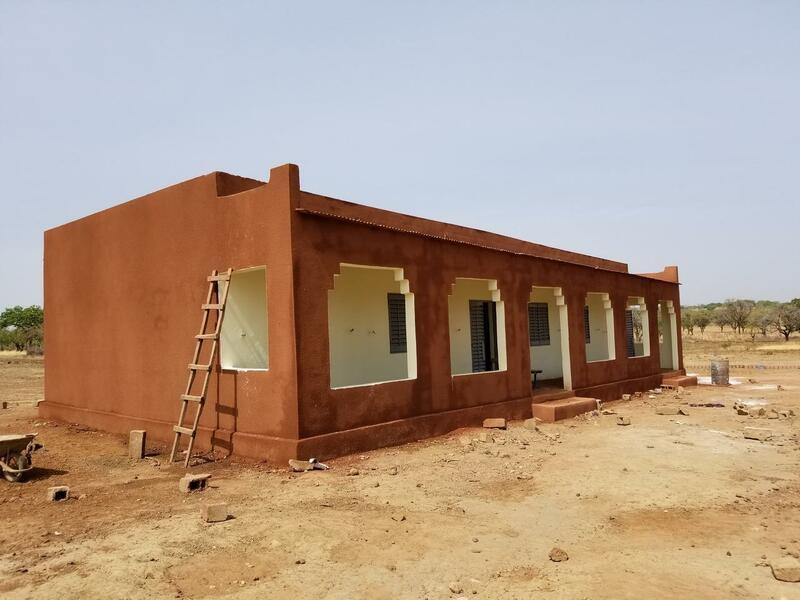 The donor for Kodialanida also designed a survey that we gave to the ten most recent schools, to determine how having the new schools has impacted life in their communities. The survey will help us determine future expansions and track the growth in the number of children attending school. We hope to publish the survey results on our website after the information is compiled. Most of the communities where we have built new schools have reported increased enrollments, and they would like more classrooms. Visits to other communities on our waiting list reveal that there are still far too many villages that are making do with temporary shelters: walls of straw mats or cornstalks lashed to wooden poles, or the small, dark and stuffy buildings made of mud brick. Children learning in a temporary classroom. 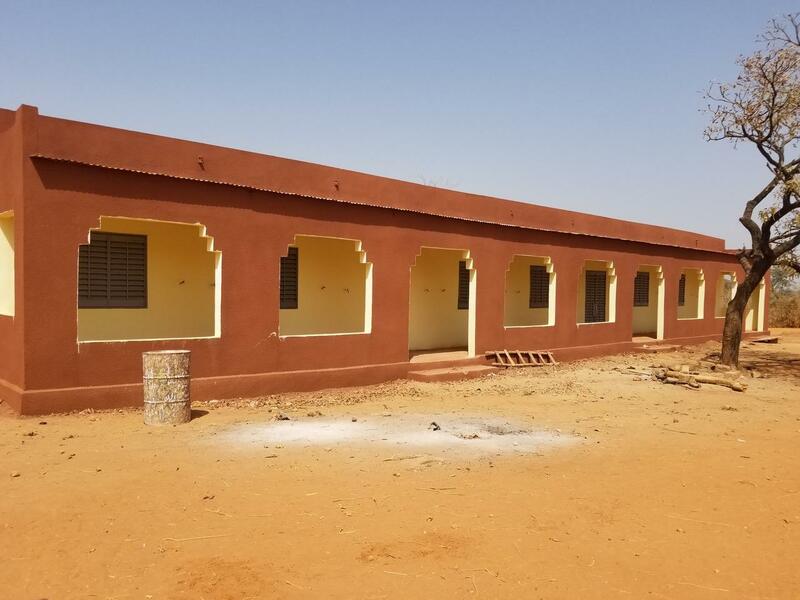 N’Dalen, our next project, is fortunate to be a large village that draws students from nearby communities to its middle school, which has an enrollment of 400+, but they need more concrete classrooms for their grades 1-3, now housed in mud-brick or temporary classrooms. As you can imagine, it is much easier to hire and keep teachers if they have decent, light and airy classrooms in which to teach. All our classrooms meet or exceed government standards, with 5 large windows in each classroom. Contrast the photo below with the one in Tabakoro: the mud-brick walls have large cracks, and the doors and windows are in disrepair. 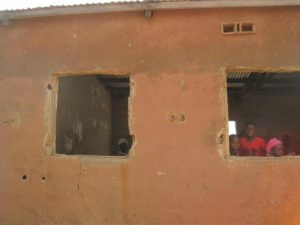 But we also have a request for a new middle school in the large town of M’Pessoba. Middle schools are rare outside the major cities, which means that for most children in rural areas, their education effectively ends with grade 6, unless there is a middle school within walking distance or parents can afford to board their children with friends or relatives in a town that does offer grades 7 through 9. High schools are usually found only in the major towns and cities. There is no end to the demand – and need – for more schools, and our waiting list keeps growing. 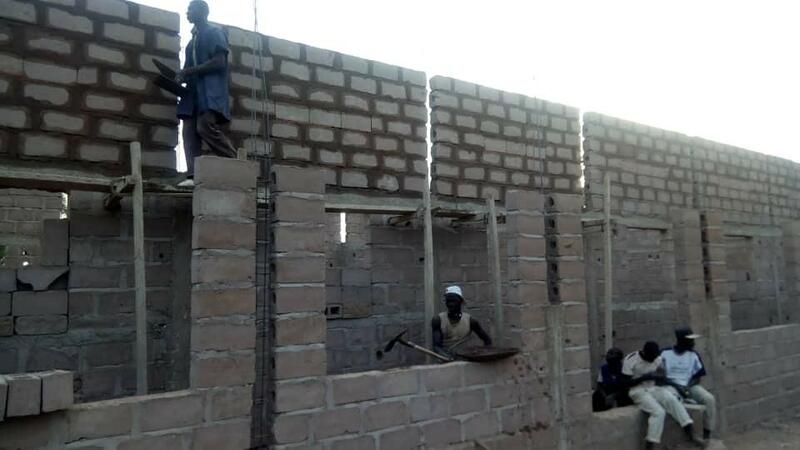 The two schools presently under construction should be completed by the end of February, and depending on available funding, we will start construction in N’Dalen by next fall. Build a School in Africa is a very small organization, but we have managed to raise funds for 19 schools since 2005; N’Dalen will be our 20th. A popular Malian proverb states “Dooni dooni kononi be nyaga da” — “Little by little the bird builds its nest.” Every donation helps, and we thank all our supporters for their generosity. I ni ce — Thank you! Best wishes for a joyous and healthy year in 2018. We are delighted to announce a partnership with Wigigo, an app developed by a Swiss technology company. Last year, the developers told us they would like to help support the construction of our next school. 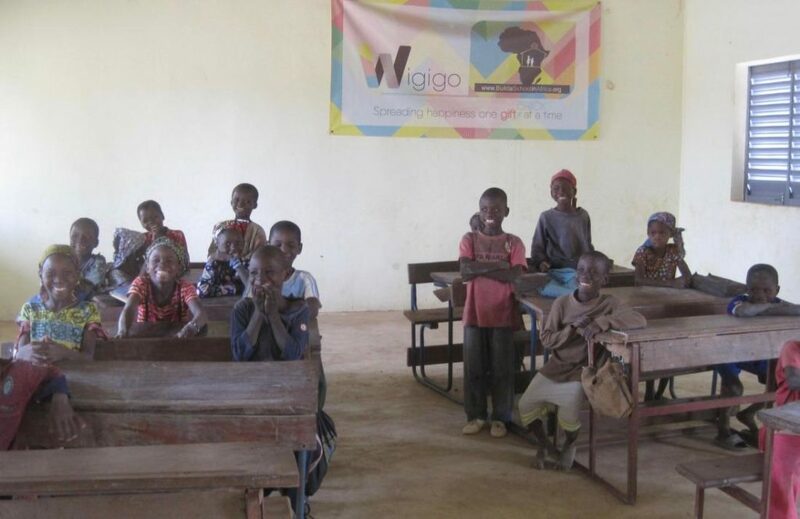 Every time you use their app Wigigo to purchase a gift, they will donate 1 Euro (a little over a dollar) to Build a School in Africa, up to $20,000.